The tour is not a comedy, but a dramatic stage production dealing with the life of Michael Corlyar. “The play tells my story,” he said. “Michael Coylar’s Momma,” showcases a timeline of ups and downs of the comedian, chronicling his admiration for his mother, childhood, life and career in Hollywood. A Chicago native, Colyar always wanted to be an actor and go to Hollywood. He admits it wasn’t always easy getting and staying there. His journey of himself going through his personal and professional turmoil presents itself in the play. Colyer is transparent in the show, staging an honest dialogue for his fans and peers to witness. “The show is about how my life has transcended,” stated Colyar. “I peeled my skin off and gave it to them rough,” Colyar referencing to how he hones in on a raw performance for the production. He had a special relationship with his mother. Influenced by his mother’s love and support, the one-man show is not just about himself but a dedication to his mother. Although, he made it to Hollywood, he dealt with money woes, stating, “I have been rich twice and have been broke seventeen times,” he jokes. Colyar captures his truth; sharing his struggle with substance abuse in the play. He battled an intense drug addiction to crack cocaine and recovered and is happy to announce that on March 6, 2017 marked another year of sobriety for himself. He suggests that the connection between artists and substance abuse can be a common thread in the entertainment industry. With the help of his mother, wife Kelly and spiritual journey, helped him to overcome his addiction. After his mother died, he believes his mother sent Kelly to him. He credits her for supporting him through his struggle. 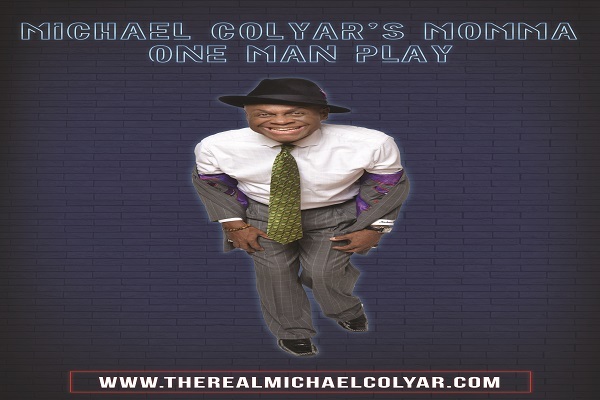 “Michael Colyar’s Momma” captures personal bouts and his career in Hollywood. Honored by the success of the play as well as earning the praises of his peers, Colyar reveals how special it was that Louis Gossett Jr., Angela Bassett and Jenifer Lewis raved about his performance in the show. Tina Knowles came to the play with husband and actor Richard Lawson. Knowles was impressed by his jokes, that she used them on her Instagram account the next day. “I love to inspire others,” said Colyar.